In a corner of a darkened courtyard, I knelt next to a brick wall which separated me from an inferno on the other side. Bright orange flame shot out between the bricks, making a lattice of dangerous light. The bare skin of my arms felt as though it might singe as I reached with a gloved hand to pull out a brick so I could look beyond the wall. I wore goggles to protect my eyes before I peered into the flames of the low-fire salt kiln. Inside, the blaze danced around carefully-placed clay pots and sculptures which at 1200 degrees glowed orange-white. The combustion of the salt, the newspaper burritos full of copper and iron, the banana peels, and the kelp we had packed between the pots before the firing made scarves of violet, yellow, and even neon-green flame dance inside the kiln. I was firing the kiln in the kiln yard behind the studio of Paul Soldner, where I –– along with about 10 other students––worked and learned together. Paul was a pioneer in clay and had developed the low-fire salt firing method that I used for the abstract figurative sculptures I made when I was there. Each time we fired, we had no certainty about the outcome, but had to put our faith in serendipity, in intuition, in the happy accident, in the magic of earth meeting fire. This was part of the philosophy Paul taught. More than I realized at the time, his philosophies and his example deeply affected my approach to art, teaching, and life. Before I knew that my career would be in writing, teaching writing, and thinking about environmental issues, I studied art. Growing up in a family of artists, my life habits were shaped by printmakers, potters, painters, and musicians. For the first seven years of my life, I lived with my mother, a functional potter who fired salt kilns, and my father, a painter who steadily moved toward greater abstraction, which was an education in itself, but after they divorced, I moved with my baby sister and my mother to a number of different artist colonies. While I always wrote stories and poems and kept journals, I also made things out of clay and paint, mostly because that was what everyone around me did. Years later, I ended up studying clay with Paul. My first experience with Paul was not memorable. Being eight years old, I knew Paul as one of the artists in my life at Anderson Ranch Art Center in Snowmass, Colorado. The Ranch consisted of a loop of cabins made into studios…a print shop, drawing studios, clay studios, a kiln yard, and a big grassy area for sitting and talking or playing frisbee with the dogs. Artists worked in all kinds of styles and mediums, collaborating on everything from a salt firing to dinners. As a child I was given the privilege of wandering from studio to studio. Clay artists named Suki and David often invited me to make designs with inky clay slip. Jeffrey, a printmaker and painter, let me pull the squeegee across big silk screens to make designs on t-shirts. In the communal kitchen, a woman named Rhonda who wore jean skirts and brightly-colored bandanas over her huge black ringlets let me help her chop vegetables for her amazing soups. 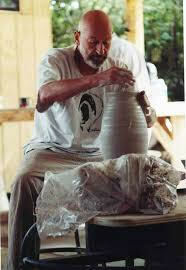 Paul visited often, giving demonstrations, helping build kilns, always buzzing about with joyful energy. I had no idea that he was the founder of the Ranch or one of the artists who revolutionized what it meant to work with clay, or that his role in WWII had forever changed his perspective about being alive or that he was a student of Zen or a brilliant teacher. I did know him as a warm and vigorous person who came to our communal potluck dinners where we sat along the sides of a long, long table passing salads and homemade breads back and forth while people talked about everything from glaze recipes and which trails led to hot springs to politics and philosophy. None of that mattered to me then. He was just one of the bright threads in the fabric of my exciting home life. Over the years, when I journaled, I also sketched things. I became good at drawing likeness with pencil or charcoal. I drew my friends, trees, dogs, plants, landscapes. Everything I drew was realistic. This adherence to realism made me feel like I was a technician, a recorder, rather than an artist. And my work didn’t do anything, like my mother’s beautiful cups and bowls. 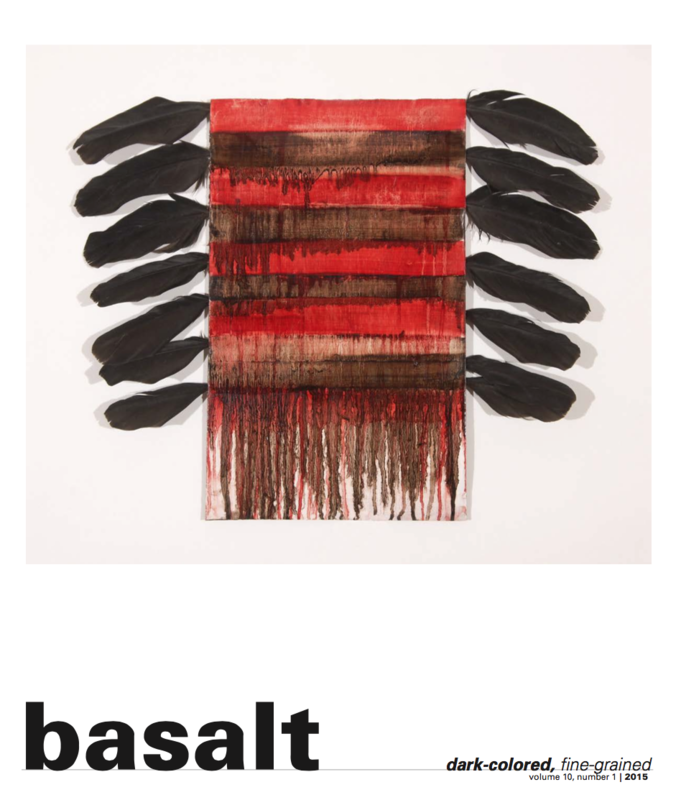 Part of the reason this felt like a weakness was because my father was well-established in abstract painting by then. When I worked with clay, I made sculptures of human bodies and faces, and this became the work that I did most often––sculptures of faces surrounded by flowers or clay figures in dance positions. I didn’t feel like they were cutting-edge, by any stretch, but I loved working in clay. When I was drawing something from life, like a tree or a shell, at some point the eye and the hand were communicating, the hand scratching the pencil over the surface of the paper, responding to what I saw, without me thinking about what it should look like or where my hand should go. Maybe this was a little like what athletes call being “in the zone” or what students of meditation might call “being fully present.” No matter, it felt like an escape from the ego. And with clay, I just followed what the clay itself suggested. Forms were born out of the gestures of the clay, or what the clay seemed to be telling me, which was quite intoxicating, but still I finished them in ways that felt stiff. I thought maybe what I needed was to study with someone who was more free, but also somehow more spiritual in his approach to clay. So, on a whim, I wrote to Paul Soldner with some images of my work, and he invited me to come study with him in California. I remember the day I received the letter that would change my life. It was hand-written in Paul’s large, flowing handwriting, and the words invited me to come work in his graduate student studio. My mother and I danced around the kitchen whooping, the letter held aloft in my hand. I was going to study with Paul who had been a hero in my household since I was small. 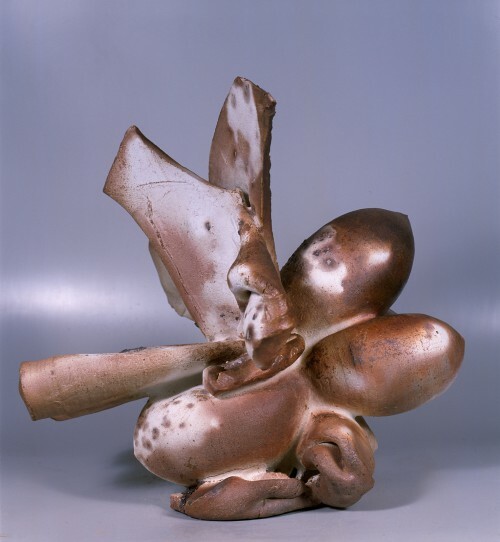 Paul Soldner, along with Peter Voulkos, another courageous clay artist who taught for many years at Berkeley, and a handful of others, completely freed the world of clay from the realm of traditional craft and transformed it into a serious art form. Peter Voulkos, Paul’s teacher and friend, and Paul were deeply influenced by the sensibility and philosophies of Zen, the abstract expressionist painters, and jazz musicians. Peter and Paul began pushing the limits of form. Paul was especially interested in raku, a rapid firing technique used when making ceremonial tea bowls in Japan and was responsible for developing the technique many people refer to as “American raku.” In an American raku firing, pots are lifted with tongs from the kiln while they are glowing hot and plunged into burnable materials like straw or newspaper, then covered with something like an upside-down metal trashcan to reduce the oxygen inside. This process results in exciting, unpredictable patterns and colors on the surfaces of the pots. Paul found this technique thrilling. His beautiful vessels rebelled against symmetry and adhered more to an asymmetrical aesthetic found in Zen Gardens and some Japanese brush paintings, and he was very much interested in learning from the interaction of clay and fire themselves. This band of potters took clay in all kinds of different directions. One summer, my mother took my sister and me back to Snowmass for a workshop called California Clay in the Rockies where Peter and Paul and their students and colleagues had gathered. We met Robert Arneson who was making enormous distorted sculptures of faces which he called nuclear warheads, Michael Frimkess whose tall vessels were covered with drawings that recalled Greek frieze images, and Marilyn Levine whose sculptures of handbags and shoes were nearly indistinguishable from leather until you picked them up. Paul was experimenting with his low-fire salt technique which resulted in tall vases covered in clouds of salmon, iron-red, and charcoal gray, colors that echoed the landscapes he knew intimately. Clay in these potters’ hands was no longer simply about making functional vessels; it was passionate, political, reverential, and definitively new. Paul was a hero to my mother at that time, and later in her life, he became a good friend. Studying with Paul meant working in a long sun-filled studio in southern California. I rode my bike past a lemon grove and through eucalyptus-lined streets to the studio each day. The studio had one long wall of windows with long work tables lined up inside. Each of us had our own table. We had come to California because Paul had inspired us in some way––his beautiful asymmetrical forms, his techniques with low-fire salt and raku, his revolutionary energy that transformed ceramics, or his playful experiments with clay. And then some came for his reputation for throwing not just great pots, but great garden parties–– gatherings of brilliant people complete with stimulating conversation, dancing, a wide array of food and drink (including dandelion wine which Paul brewed himself!) and his hand-built stone hot tub. But his adherence to joyful enterprise was not born of frivolity. Paul had intentionally turned toward living joyfully and full-heartedly after serving in the military as a medic and liberating Mauthausen concentration camp, which was a labor-death camp outside of Linz, Austria, at the end of World War II. Having grown up in a Mennonite family, when Paul was drafted, he registered as a conscientious objector and thus would not carry a weapon, but instead served as a sergeant in the medical corps. Paul’s encounter with the horrors of the camp would stay with him for his entire life. He would also carry with him the resilience of the human spirit he found there. He remembered that even in the most unspeakable conditions, the prisoners still made music, told stories, and drew pictures on the walls. Knowing that art could survive during even the most astonishing atrocities led Paul to pursue a life of kindness and of perpetuating joy and beauty. Paul taught by example. By the time I was working with him, he was doing large abstract sculptures out of slabs of textured clay. Often, he would ask us to see the bottoms of our sandals and hiking boots to see if he wanted to use the pattern of the sole in the clay. If he liked it, he would throw a slab on the floor and have us step on it. The footprints of many students now live forever in the clay pieces he was building at that time. His experimental techniques gave us permission to experiment ourselves. He opened the door to the unknown and suggested we step through. He demonstrated firing techniques, throwing techniques, shared glaze recipes, and told us stories. When he worked, he worked hard. He did not see obstacles. Once he went to give a workshop somewhere and wanted an updraft kiln and all they had was a downdraft, so he spent half a day taking the kiln apart brick by brick and rebuilding it as an updraft. When sitting down at the wheel to do a pottery demonstration, most potters would work to get perfect center. Paul resisted this, saying, live center––not dead center––would give you living pots. This kind of quiet irreverence for rules was common for Paul. Mistakes were always an invitation to see something new. The firing techniques he loved most relied heavily on chance, and he inspired us to expect the unexpected and to embrace surprise. Firings of all kinds were a time for all of us to gather for a potluck in the kiln yard to share our stories about projects and our personal lives. 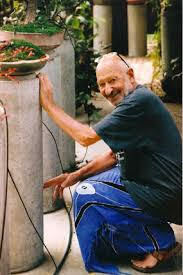 Paul’s easy laugh floated through the courtyard, making everyone feel welcome. Paul did not make aesthetic judgments about student work. Instead he encouraged us by noticing what we were doing. This was something I found frustrating at the time. I will admit wanting Paul to say he liked my work. Wanting him to approve of it. But what I eventually realized was that by only addressing what I had been doing with the clay, gently reflecting my own progression back to me, he forced me to make my own assessments of my work. I had to learn to measure the quality of my artwork against my own vision. He would say something like, “They seem to be getting larger, Heather. Are you planning to make them even bigger?” If I answered yes, he would offer, “Well there are several techniques you could try…” and share them. And my work did get bigger, and more abstract, more like a variety of forms (human and nonhuman alike) coming together, more free. The results of his teaching style were evident in the incredibly diverse work his students were doing. 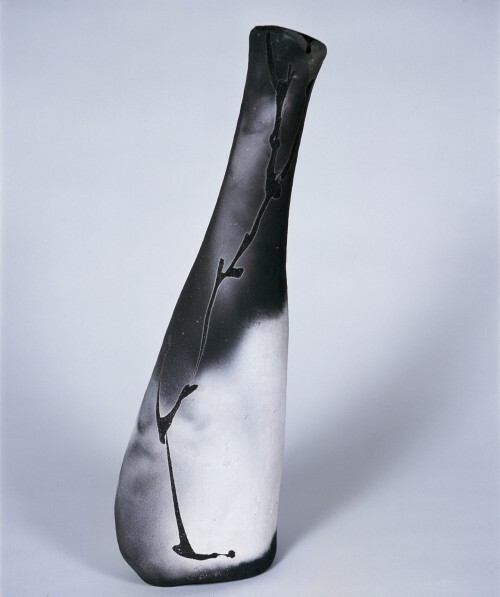 Masaki threw very tall vessels with sculpted wave shapes on the outer surfaces. Karen decorated her thin-walled mugs with tiny points of slip so they were slightly dangerous to grab. Simon built instruments out of clay. Mike made tall rectangular shapes that together looked like a hip-high, salt-fired clay city. Paul helped us find our own voices, our own forms. Years later, I find myself in the position of teacher, and my students use words, not clay. Still, in my classes, I find myself mirroring Paul’s teaching––offering a variety of techniques, encouraging experiment and risk-taking, reminding students that they are the only ones who know the essence of their poems or their essays. And even in my own work with words, which, like my early drawings and sculptures, is rooted in representations of the real, I find facing the page with the spirit of exploration to be the most fruitful for me. And my approach to life has been seasoned by the stories we tell about Paul. I found myself talking about him in the kitchen of some friends not long ago, remembering his beauty and his passion that I saw as his student, but also heard about from my mother. When Paul’s wife, Ginny, died, my mother went to help Paul for a couple of months with packing her things, and moving him from their winter home in California to their summer home in Colorado, as Ginny, Paul and their daughter Stephanie had done every year when Ginny was alive. This led to my mother assisting him at workshops until he was no longer doing them. She saw a more private, reflective side of Paul. He tended nearly fifty bonsai in his garden. He knew which day each different flowering plant would come into bloom. They took long, quiet walks into beautiful landscapes which she thought she could see reflected in his work. As his back began to give him trouble, she would wedge clay for him or throw simple forms for him to use in his demonstrations. Once he sent my mother a box of persimmons which had grown on his property. Another time, he sent an envelope full of seeds he’d harvested from the California poppies in his yard. She planted those seeds in Illinois and to this day their bright red faces emerge each spring. After sitting with that low-fire salt kiln all night––my shift–– and letting it cool, I opened it with some other potters who had put their pots in the kiln as well, and the results inspired many conversations. Wasn’t this pot wrapped in seaweed? Look what the iron did to the surface of this sculpture here! And: Look, here the smoke has left its signature, the gift of the fire! Some of our pieces cracked, but Paul had taught us not to be disappointed. It simply taught us more about clay bodies and structure. And often the cracks made pieces more interesting. We learned so much each time we opened a kiln, and then we returned to the studio to get back to work. Not long ago, a very accomplished writer friend asked me about the book I recently published called Where Honeybees Thrive: Stories from the Field. The book is a mosaic of stories about people and insects and art. He asked me how I had decided when to employ which style of writing as I seemed to be using many different approaches. His question made me pause and reflect. I honestly felt slightly embarrassed. It had never occurred to me that I had to follow any rules of form as I wrote and put the book together. I knew I wanted it to be a combination of stories, poems, science, and visual artwork, because all of these articulated things in different and important ways, and then I simply tried things and moved them around, wrote and rewrote until they seemed to work––until the manuscript was finally the book that I wanted to make. It was only later that I realized how deeply my approach reflected my training as an artist, being a student of Paul’s, and living in community with other artists. What I learned then gave me permission to take some risks and to make something that was true to my own vision––that reflected my love for this remarkable planet and the wonderful people I encountered on my journey with honeybees, that included the surprising things I discovered that forced me to change my mind, and that even revealed my love of dandelions. I so wish I could thank Paul in person today for that freedom.